There’s a magic that happens when vegetables are roasted. There’s a double magic when bacon is mixed in. 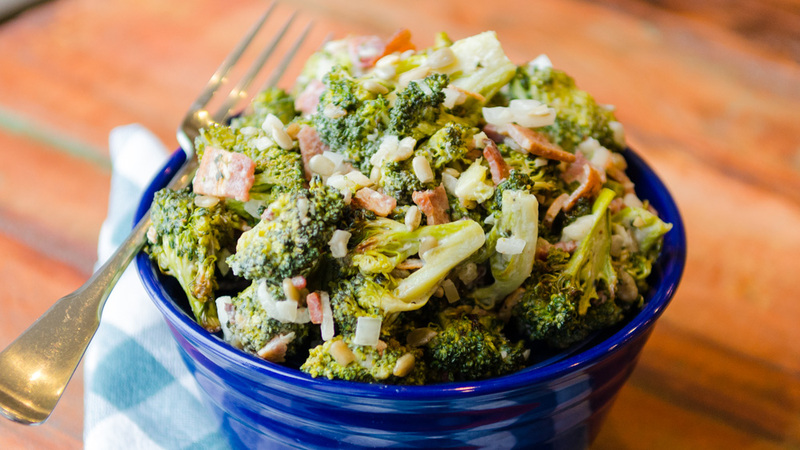 Add a little garlic to the roasted broccoli mix and you have low-carb side dish that’s one of our favorites all year round. Since having to make a big cutback in high glycemic carbohydrates, we’re always trying out different recipes that are high in protein, high in vegetables and low in sugar. My preference is for it to be really crunchy at the same time. Roasting any vegetable is almost guaranteed to be a winner and roasted broccoli is one of the few that retains its crunch. Be sure to roast the broccoli until it’s starting to blister and blacken. This is where you’ll get the most flavor. Use about 1.5 pounds broccoli to fill a half sheet pan almost perfectly. Trim most of the stem off the florets and then cut them in half to maximize the amount of surface area that is in contact with the hot pan. For the bacon, a thick cut variety works best here. Bonus points if its been smoked. Cook it just a bit longer than normal so that you have good crispy bacon in the mix, just like in a proper chef salad. You can bring even more crunch to the party by adding in your favorite nut or seed. I like toasted sunflower seed kernels, but almond slivers or pistachios would also be great.